In Town Hard-Hit By Katrina, Buyouts Offer Opportunity — For Lucky Few Ten years ago, tiny Pearlington, Miss., got hit with a 30-foot wall of water, inundating homes that hadn't flooded in 50 years. Some rebuilt — repeatedly — but for others, the incentive isn't there. A view of Pearlington, Miss., 10 years after Hurricane Katrina. 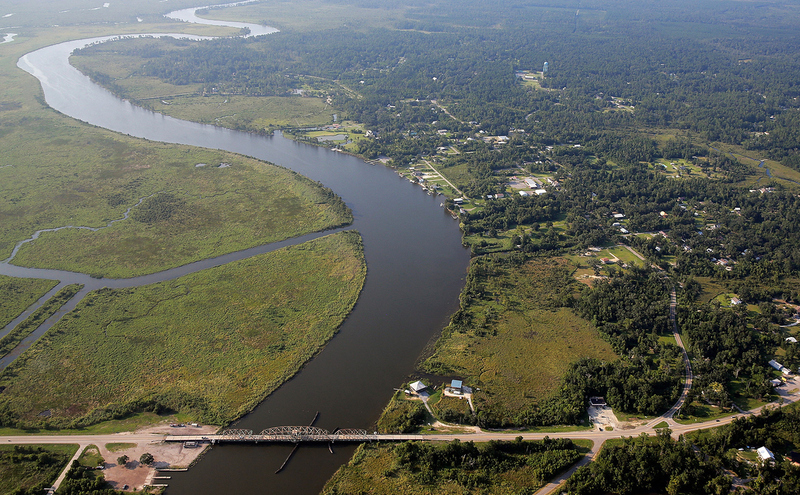 The East Pearl River and St. Tammany Parish in Louisiana are to the left. Bill Griffin, 78, has lived here his entire life — the past 50 years amid the huge live oak trees on a quiet block of Adams Street. He had been through several big storms before. "Katrina's the first storm that put water on this street in 50 years," he says. "I had 10 feet in that house." His modest, brick, ranch-style home filled up with seawater but didn't budge from the concrete slab on which it sits. "I lost one brick," says Griffin. "I hate to see it go down." But that's what will have to happen. The house is one of a handful in low-lying Pearlington that has been bought by the state of Mississippi because of the likelihood it will flood again. In fact it, and many others in Pearlington that never had flooded before Katrina, took on water again during hurricanes Gustav in 2008 and Isaac in 2012. The Griffins completely rebuilt the house inside after Katrina, tearing out the moldy walls and floors. Bill says he "put all new wires and everything new in it." They were back living in the home just a year after the storm. But shortly after, the state announced it would spend $10 million to buy out homes in Pearlington that are in what are now considered to be flood-prone areas. Bill Griffin and wife Gail signed up — then waited for years, without knowing if they'd be approved. "What do you mean, what's it been like?" the 78-year-old asks rhetorically. "Hell, we go on living, man. Can't let this stop you. ... I don't get frustrated, son — I'm too old for that." Then daughter DuJuan Bosarge chimes in: "Well, it has been somewhat frustrating — because after they flooded for Isaac, do you put your flood money that you got for the flood insurance back into the home, and hope you never flood again? Or do you hold on to that money and hope for the buyout?" The Griffins did the latter, foregoing repairs the last time the house flooded, and finally were approved for a buyout earlier this year. They closed last month, and are now building on an adjacent lot a new house, which will be elevated nearly 23 feet up off the ground — well above new government elevation standards, just to be safe. Bill Griffin and his wife, Gail, are building a new, elevated house in Pearlington, adhering to the new FEMA flood plain elevation standards. Bosarge says that, a decade after Katrina, her parents finally can see the light at the end of the tunnel. "We hope to have this house finished within hopefully three or four months, and they'll be in it before the holidays," she says. "That's the plan." But the Griffins are among the lucky ones, as very few other families in Pearlington will be helped by the buyouts. A Hard Fight For A Political Voice In Biloxi, Miss. 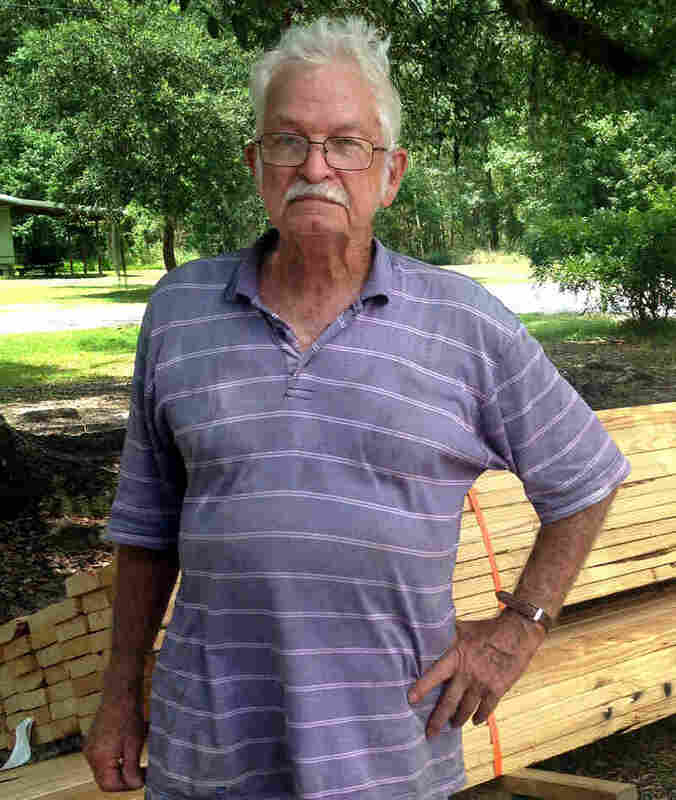 "We're being punished for what happened to us," says David Yarborough, the Hancock County supervisor who represents Pearlington and other nearby coastal areas that were hammered by Katrina. "I'll say it bluntly, and I want Washington [D.C], I want Jackson [the state capital], I want everybody to hear it: The buyout going on in Pearlington right now? The whole situation's been a joke." Yarborough says 117 homeowners signed up to have their flood-prone houses purchased; about half were eligible. He alleges that state officials dragged their feet for years before starting the program, then cut the funding, then restored it. And he says that government red tape has slowed the buying process down to a crawl. "We're seven or eight (homes) right now bought," Yarborough says. He thinks only a dozen or so homes will have been bought in total when the program ends in November. 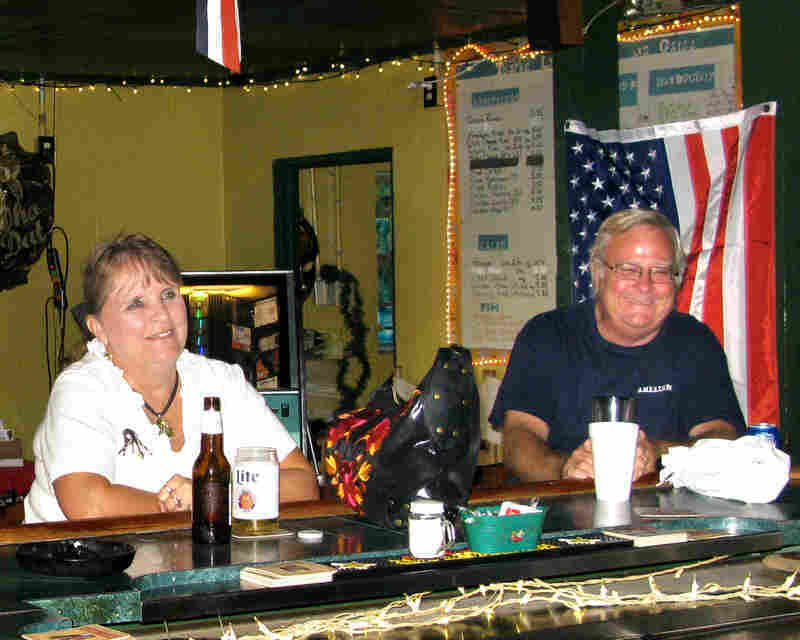 Among those with no chance of a buyout are Tim and Jacki Blackwell, regulars at the Turtle Landing Bar & Grill in Pearlington, whose home in the nearby Oak Harbor subdivision was inundated by Katrina. 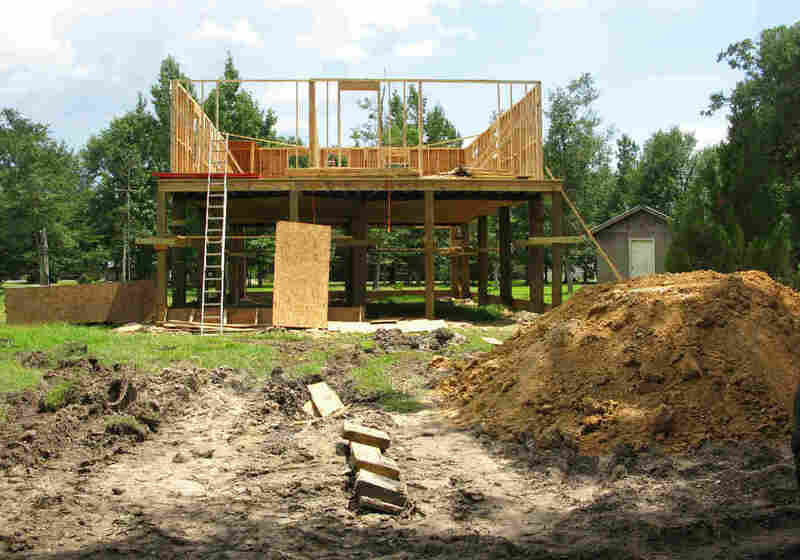 "We rebuilt for Katrina, and then like idiots we rebuilt again. And it flooded again, and then we put some of it back, and it flooded again," says Jacki Blackwell. "And after that, we didn't rebuild." Each time their home flooded, the Blackwells say, insurance covered less and less of the damage, yet their rates soared. Rebuilding now would mean elevating their house, which the Blackwells say they cannot afford. "We're moving," says Jacki. "We're leaving here, because we can't do the flood anymore. We lost everything we own two or three times." "And we've been living in a camper on and off ever since Katrina," adds Tim Blackwell. "So we bought a house in Georgia, and unfortunately we have to leave Pearlington," says Jacki, 62, who retired from her job this month. "We're just too old to start over like that, you know, so we just gave up. We just basically gave up." The Blackwells' move began earlier this month. For the friends they're leaving behind, whom they've struggled alongside in the difficult 10 years since Hurricane Katrina landed, they've left a box at their favorite hangout. It's full of photos and note cards, which the Blackwells hope their friends will use to keep in touch.